LOW T? THE SAFE AND NATURAL WAY TO BOOST IT IN 24 DAYS. Throughout much of their lives, men have a weight advantage over women, whose bodies are naturally designed to hold more fat. Fair or not, men’s hormonal make-up, muscle mass, and unique metabolic profile make it easier for them to stay lean. But certain conditions can overturn that gift—the passage of time, the pressure of work and others, the wrong ‘fuel’—and lead men to a hormonal state that more closely resembles, well, women. With this book, New York Times bestselling author Dr. John La Puma reveals the breakthrough 24 day fat-loss plan specifically engineered for the male brain and body that is dramatically changing lives. Reboot, rebuild: REFUEL™. JOHN LA PUMA, M.D., is a board-certified specialist in internal medicine, co-founder of the popular ChefMD® video series and nutrition expert for the Turner Wellness Network. His recent New York Times Op-Ed, Don’t Ask Your Doctor About ‘Low T,’ was one of their top e-mailed stories when it published. He is also a New York Times bestselling author of ChefMD's Big Book of Culinary Medicine, and the coauthor of the bestselling Cooking the RealAge Way and The RealAge Diet. He has hosted two PBS Specials. The first physician to teach cooking and nutrition in a U.S. medical school, he has been repeatedly named "One of America's Top Physicians" by the Consumers' Research Council, and has been called a "Secret Weapon" by the Wall Street Journal. 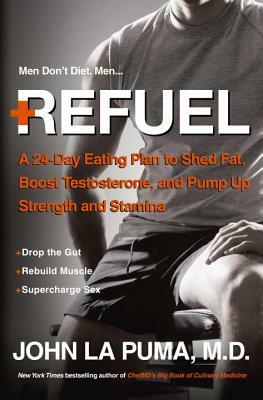 Get free book bonuses at his award-winning website, www.refuelmen.com.